There are lot of ways from which you can easily rename multiple batch files in Windows Operating System. You can use Windows O.S. 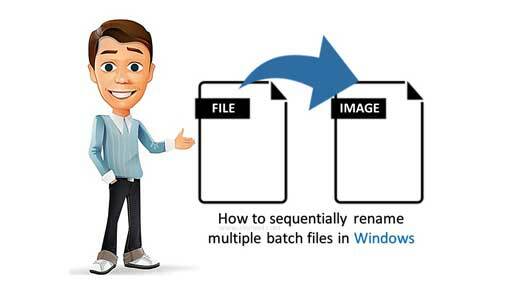 inbuilt feature or also use any third party software to sequentially rename multiple batch files in Windows. If you have more than one folders and files and want to rename them, it can be tedious to changing the name one by one. But Windows O.S. allows different ways from which you can make the process easier and rename them quickly. This article covers how to use Windows Explorer and various other utilities to quickly rename batch files in Windows Operating System. In Windows O.S. the File Explorer allows you to quickly do this job. You can select any one file and then press “F2” function key to rename any single file. You can also quickly rename multiple bulk files with the help of Shift and Ctrl keys along. Step 1: Open File Explorer or any folder in which you have more than one files or folder, which you want to rename them. Step 2: Select the first file or folder in active folder. If you want to select more than one files or sub folders continuously then hold on Shift Key. Now click on the last file or folder. If you want to select non-continuous files then hold on Ctrl key and select more than one files as per your need. Step 3: Press F2 function key to rename them. You can also choose “Rename” option in the Home tab. You can also press right mouse button and choose “Rename” option in cascading menu. Step 4: Type new name and press Tab key. You can also hit enter key to finish this process. There are lot of tricks available on your computer, if you have knowledge about these tricks then you can easily surprise to your friends, colleague, family members and others by showing presentation of your trick. Lot of time most of the persons ask a question can we create or save any nameless file or folder in my computer? The answer of this query is “Yes”. After reading this article you will be able to use given trick for nameless file or folder in windows operating system. how you could easily prepare nameless files or folders on your computer in this article. After reading this article you try this trick and quickly change or create files or folders which name you don’t want show on screen. That type of trick easily worked on different windows operating system. During working on Windows O.S. if you have better command on Shortcut key, then your work much easier. In absence of mouse, most of person facing lot of issue. Don’t worry Windows Keyboard shortcuts make your work easier and save your lot of time. You must try to use given Computer – keyboard shortcut keys for Windows. These shortcut keys are nothing it is a set of few keys or combination of keys which is used to run any specific command in Microsoft Office, any application software or an operating system.